Bake a ten inch round cake. Also bake a six inch round cake. With a knife you will round off the top edges of the six inch round cake. This will be the turkey’s tummy. A much easier way to do the tummy is if you have a six-inch round metal bowl or ovenproof glass bowl to bake your six-inch cake in. Just make sure your batter is one inch to one and a half inches from top of the bowl. Next place the ten inch round cake on your board. Then place the six inch round cake on top of the ten inch round cake making the edges of both cakes even. Refer to the picture of the turkey cake. Using your six inch round cake as a guide, cut the ten inch round cake around the tummy almost half way on both sides. Form this point, cut a slight angle to the edge of the ten inch round cake. Do this on both sides. The pieces you cut away are used to form the neck and the head of the turkey cake. Piece the neck and the head on the turkey making sure you use icing to hold them together on the cake. Next, make a medium brown colored icing. With brown icing and round tip, size #5, draw lines for the tail feathers of the turkey cake. Make a golden yellow icing and an orange icing. You will be using star tip, size #18 on the entire tail. Using the picture of the turkey cake as a guide, fill in the gold, orange and medium brown icings. Now use your medium brown icing and round tip, size #5 and go over the previous lines of the tail. This will give definition to the tail feathers. Next, take the orange icing and star tip, size #18 and make the eyes on the turkey head in oval shape. Use the same size star tip, and black acing and make the pupil in the white eye at the bottom of the oval. Next, use your orange icing and star tip, size #18 and make the beak by squeezing icing onto the cake at the base of the eyes and slowly raising up. Stop squeezing and slowly pull up to a point. Practice on wax paper first if you need to. Now make a small amount of red icing and use rose tip, size #104 to make the snood on the head of the turkey and the wattle around the beak. To make the snood on the head, hold pointed end of the rose tip on the surface with the short end facing up. Squeeze until you have the shape. To make the wattle around both sides of the beak, hold the pointed end near the surface at the center above the nose with the short end facing down. Slowly squeeze while drawing the tip down around the beak stopping under the beak but still squeezing a little bit. Do the other side. Be sure to practice this on wax paper until you have it right. Now your are ready to cover the turkey’s body. Use medium brown icing and leaf tip, size #352. Hold the tip with both ends of the tip on the surface. Squeeze slightly lifting up and ending in a point. Work in rows from the bottom of the tummy to the top of the tummy. Refer to the picture. Finally, with golden yellow icing and star tip, size #18, put two feet right on the board. Put a second layer right on top of the first. If you have made a turkey cake or other Thanksgiving themed cake that you would like to share, please submit your cake here and let us know how you made it! We would love to feature your cake on our site. Please make sure to include a photo of your cake and a description of how you made it, so that we can all share ideas and learn from each other! 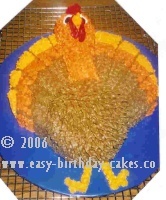 See Turkey Cakes or other Thanksgiving CakesThat Were Submitted By Others To This Site! Other pages you don't want to miss!